I love to use music to set a tone and I have lots of playlists for my various moods. I have one for running and one for road trips and one for romance – you get the idea. What I didn’t have until today, however, was one for the beach. I’m not sure how I missed out on creating one but now I have and of course I used it to inspire this week’s Ten on Tuesday topic: 10 Favorite Beach Songs. The Summer Wind by Frank Sinatra. My all time favorite although Dale prefers the Johnny Mercer version. Knee Deep by Zac Brown Band. 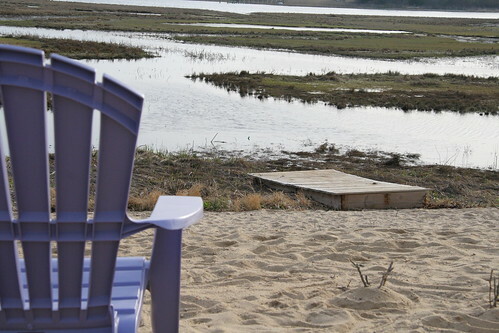 Best line: only worry in the world is the tide gonna reach my chair. In the Summertime by Mungo Jerry. Good, old fashioned fun. The Boys of Summer byDon Henley. Makes me think of my college days. All Summer Long by Kid Rock. Perfect party song and this one makes me think of Kym. Walking on Sunshine by Katrina and the Waves. Is there a peppier song in the whole world? I think not. Theme from A Summer Place by Percy Faith. It’s a classic and we always listen to it when we go to the Cape for our vacation. Sea Cruise by Frankie Ford. Speaking of our Cape Cod vacation – I always listen to this one (and the next one) when I drive over the Bourne Bridge. If the traffic is bad I get to listen to them several times. Beyond the Sea by Bobbie Darin. See above. One Particular Harbour by Jimmy Buffett. My most favorite Buffett song is also perfect for the beach. Those are my favorite beach songs – what are yours? If you wrote a post for today be sure and include your link below. And if you want to receive the Ten on Tuesday email then click here to sign up. And . . . oh my god . . . Sea Cruise! Love it. Great choices, but let’s not forget Under the Boardwalk by the Drifters, Summertime by Janis Joplin, Hot Fun in the Summertime by Sly and the Family Stone, and Sunny Afternoon by the Kinks. Oh my! So many great summer songs. i would have to add some Beach Boys to the list. Percy Faith’s Summer Place has to be my all time favorite summer romance song! Not all are summer themed, but remind me of various summers in my teens and 20’s. All Summer Long by the Beach Boys and Beach Baby make it 85 degrees all year round! I never think of beach songs as I rarely get to the beach, but your list is a great mix of summertime tunes! I have to add a little country flavor to your lists … ‘Water’ by Brad Paisley … ‘Cruise’ by Florida Georgia Line … and one that is really about the wintertime and waiting for summer to come back, but is one of my favorites, ‘Til Summer Comes Around’ by Keith Urban. I like the Sinatra version of Summer Wind, too. In fact, I’ve been known to play it over, and over, and over, . . . . When I was a teenager REO Speedwagon was on the radio 24/7. I use to catch the bus to the beach every chance I got. The bus had a rack in the back for us to put our boogie boards. Heard It From A Friend was our summer beach song. Now I love Sheryl Crow’s Gonna Soak Up the Sun. Great topic, Carole! In a rare act, I read your post and all the comments and drifted on a wave of nostalga to the 80’s–I want to make a mix tape! Correction, I always read all of the post, not always all the comments. Ooo, great list. I’d add anything by the Beach Boys and, for peppy, Simon and Garfunkels “59th (54th? Not sure of the number) St. Bridge Song” (otherwise known as “Feeling Groovy.”) And maybe a few songs from “Hair.” I’m sure more names and tunes will come to me throughout the day as I sink back into nostalgia. I fell for The Summer Wind in 1991-love that song. And All Summer Long like everyone else! Great fun subject Carole! (Sittin’) On The Dock of the Bay, sung by Sara Bareilles. And of course a couple of Beach Boys songs: Kokomo and Sloop John B.
I love the Knee Deep song too. BTW if you are ever near Senoia, GA go there and stop in at Zac Brown’s restaurant: Southern Ground. Senoia is also where the TV show “The Walking Dead” is filmed.